These last two-and-a-half months have been some of the hardest and frustrating for New York Islanders Captain Doug Weight. The back injury he suffered and has been rehabbing, has kept him sidelined for 58 games this season. Three days ago, he learned it would end his season. “I’m deeply disappointed, but I knew it was a possibility,” Weight said. The 16-year veteran last played on Nov. 17 against the Tampa Bay Lightning and has since been sidelined with what he originally believed were back spasms - until he was told otherwise by team doctors and specialists. Due to two small fractures in his lower vertebrae and a slipped disk, the 40-year-old center has nerve damage from the amounting pressure. Not only has he had to deal with pain, but he’s even had moments where his left leg has completely buckled from underneath of him. “Anytime you’re messing with your back, your vertebrae, your nerves, and what I’ve gone through for about eight weeks now, without any movement… I think you start to realize the importance of (healing the right way),” Weight said. Understandably, the injury has made him feel defeated at times, not being able to lift more than 10 pounds with his left leg. But he’s a fighter and fortunately for Weight, the prognosis is good. With proper rehabilitation, his vertebra has started to realign, helping to relieve the pressure off his spine. As one of the oldest and most seasoned players in the National Hockey League, Weight has a lot to think about. The center loves playing and being a member of the Islanders franchise, but he needs to put his health and family first. Therefore, Weight hasn’t made any decisions on what lies ahead, but at this moment, he’s leaning towards retirement. Although, he has said he’s not going to rush to judgment. He’s definitely earned that right. Weight has hit milestones that most professional hockey players will never meet. Since being drafted by the Rangers in the 1990 Entry Draft, Weight has played for six different franchises and has had the chance to raise the Stanley Cup over his head when he won with the Carolina Hurricanes in 2006. He’s played 1,238 games (76th on top 100 all-time games played), scored 278 goals and potted 755 assists (39th on top 100 all-time assist leaders) for 1,033 points (65th on top 100 all-time point leaders). 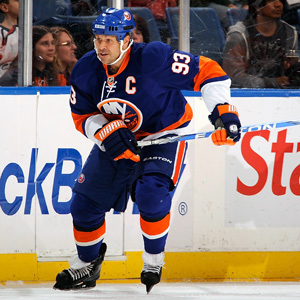 He’s been with the Islanders since 2008-09, when he joined his friend and then-team captain Bill Guerin on the Islanders. Weight was named captain in 2009-10, and took first overall Entry Draft selection John Tavares under his wing. Welcoming Tavares into his home, Weight has acted as a mentor for the sophomore forward these past two seasons. It’s that kind of veteran leadership that has made Weight such a valuable member of the Islanders franchise. But he’s also shown that he can lead by example. Even if Weight isn’t a member of the team next year and he moves on, Tavares knows his teammate’s family will always be there for him, saying that he’s become somewhat of an older brother to Weight’s children. It’s those kinds of qualities that could make Weight the perfect addition to the Islanders organization, something the veteran has said he’s thought a lot about, but has only had informal conversations with Islanders general manager Garth Snow. Whether Weight decides to retire from his hockey playing days, opting to take some other position in the field, or he decides to play for one more year, he said he’ll strive to succeed.